Floral arrangements are great because they add color and texture to a space. Plus, who doesn’t enjoy a beautiful orchid in the entry or roses next to the bed? Trust me, those bundles of greenery really add color to areas that need a filler and look great in photos. 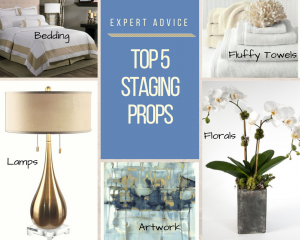 When staging your home, it is important to stay with simple shapes, so I lean towards orchids for most of my florals. I have a couple of small roses in glass vases for beds and baths, but advise to stay away from large arrangements with lots of color, or dated arrangements from consignment stores . I also recommend neutral colors, like white and yellow. As for quality, again, if it is just for staging, you can find some decent stems at Hobby Lobby. But if you want to invest in some quality pieces that are artfully potted, Ivy Guild is my favorite. 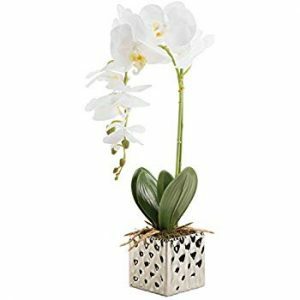 From orchids to succulents and simple arrangements, they have a great collection of timely pieces. Dressing up the bedrooms with light and feathery bedding invites buyers to feel cozy in the room. I cannot stress enough the importance of fresh, new, cozy bedding when staging your space to sell. When taking pictures of a bedroom for a listing, the bed is the centerpiece of the room. It needs to show the best that it can. Old, mismatched sheets, flat pillows and a mattress that shows from underneath is not inviting, it is distracting. I realize that you don’t want to invest a lot in new bedding for a house you are trying to sell. But, again, for under $80-$300 you can find some great options for master bedrooms as well as guest rooms. I recommend neutral bedding with a pop of color thrown in with toss pillows and a throw. It is easy, practical and makes a world of difference. I typically use the “bed in the bag” for most of my staging bed sets. Found at Bed Bath & Beyond or online – they come with everything fro m the sheet and bed skirt to the comforter and throw pillows all in one package – (you will need your own fillers though). If you room needs some color, just try to stay with simple patterns and again, think about adding colorful throwpillows and a throw or bed scarf to tie it all together. Nothing lightens up a room better than lamps. You should have one on every bedside table, side table and desk. The general rule is to have light every 50 feet. Lamps not only add light, but they are the most useful accessory around, they take up room and are artistic. Funny thing is: most people don’t have very many of them. If you are a DIY kind of gal, you can find good lamps for under $100 (Target and TJ Max are my go to). 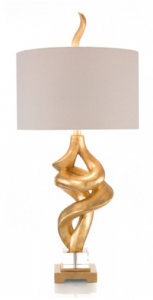 But honestly, if you want to invest in some beautiful pieces to work into your new home, Uttermost has some great lamps for any kind of style, and if you want to treat yourself to a true work of art – John Richards has the most beautiful and unique pieces on the market! Want more information on how to order Uttermost and John Richard, Contact Me! 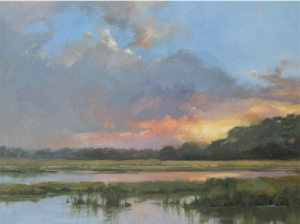 Landscapes like these from Left Bank Art are good choices because they are not overbearing and add color to the room. So, you just removed all of your family photos and now have empty wall space? Although we want buyers to focus on the house when staging, we don’t want the space to seem sterile or bland either. Simple landscape scenes or abstract artwork add color to any room. Just be sure you use a piece that is to scale with the room and it is hung at the right level. (Here is a link I found helpful when hanging art) In addition to artwork, I like using large clocks, metal pieces and unique items to mix things up a bit. For example, in a home with long hallways, I used both paintings and some scroll metal panels – that way it didn’t look like a gallery and stop the flow of the energy through to the bedrooms. 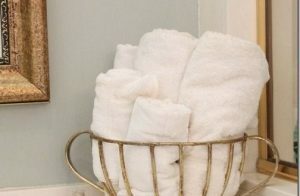 Fluffy rolled or hung towels is a must in every bathroom. I find that most of my clients have had their towels since their early 20’s…or even worse, over the course of years have become a mismatch of prints and colors. While for everyday living, this might be acceptable – for staging it is an eyesore. Bathrooms have few props that evoke emotion and add dimension. Fresh towels in bold colors can add interest to monotone bathrooms and draw your eye to the beautiful tile work. White or cream towels rolled at the end of a tub next to some candles creates a mood and sets a scene for buyers. Give them a sense of having their own spa or spending time in their favorite luxury hotel – with a simple accessory that we all appreciate but few indulge in – fluffy new towels. I prefer to roll my towels for display next to bathtubs or on large counters. When displaying hanging towels, I like to layer the different sizes, it is a bit tricky to get them the same size and to hang at the same level, but very important for photos. Skip the ribbon tied around them, but simple folding tricks add a nice interest and dimension. For more information on some of the sources mentioned above, check out their websites below. Contact Me for ordering information.